Could ONE Property, obtained with minimal capital, give you some breathing space? This is a profit model that has been around probably since there were homes and there were people who needed accommodation. It is a simple straightforward system that can be used anywhere in the world where the numbers work. In the UK, you can expect to have a minimum of £400 a month in profit from each property you take on. So imagine the possibilities, one house gives you £400 each and every month, then you take another one, another minimum £400 is yours every month – £800 a month. What difference would £800 make to you? What difference would £400 make? It is a simple method that will enable you get started in business – using a straightforward strategy that may well get you out of your job or investing in more of your own property in no time at all. This model has become known in the UK Property circles as ‘Rent to Rent’ and simply means you rent / lease a property from an owner and split the property into rooms and rent those out to individuals. After paying the owner and paying the bills, the remaining money becomes your profit. Now, think about it, Really think about it! Think of the possibilities with this. Some people will cast it aside as some kind of crazy ‘get rich quick’ scheme, instead of seeing the potential in this. You can be a conscientious person providing great accommodation and enhancing the lives of the owners and the tenants. This is not for people who just want to make a quick buck. This is for those who want a way to create wealth for themselves and their families while providing great service. As always, I say, wealth is created in service – the more people you serve, the more prosperity you create. Never forget that! A lack of education in a subject does not make you right, it just makes you uneducated :-)! So, in order to educate you, I am offering you three ways to maximise your business in the shortest time possible. Join in the Webinar Series. Get all your questions answered and most of all, you can expect to have everything you need to have a house ready to go by the 4th Webinar and you will have consistent support all the way as you join in the group calls, Listen to me talk you through every aspect of my business and how you can incorporate amazing systems in your business. The first Live Series has now ended but you can get access to all of it as detailed below. The course deals with everything you need to know about getting yourself set up to run with this business strategy. Webinar 3 – Vetting tenants, Setting up tenants who receive benefits and a failsafe way to ensure you receive the rent. The realities of doing house shares. Webinar 4 – Ongoing property and tenant management – Lets ensure you do it right, care for your tenants and owners and still get paid. In addition to the webinars, you also get access to a private Facebook Group allowing you to share your experiences of viewing properties, dealing with tenants, get even more questions answered. You also get various videos showing you how exactly to set up ads, do dummy ads for market research, how to search for suitable properties and more. 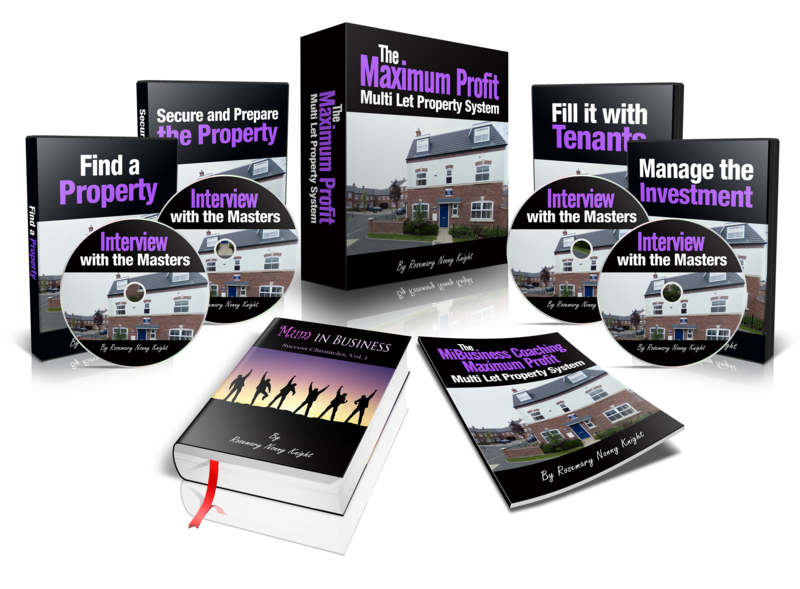 You also get interviews from other people who have set up successfully and hear how they got going, how they set up their business and how they keep it profitable to this day including a guy who has over a hundred multi lets properties. The information you gain in this series will enable you to build a business that lasts. It is information you can apply again and again to gain from a minimum of £400 a month of clear profit. You will also get a copy of the manual with the paperwork you require to get started. In all you will get at least 8 hours of video training and interviews and help as you go on your way. And all this can be done from the comfort of your home. Why spend a whole day far away from home in a training day when you can do it to suit yourself and ask any questions you want. You will also get a one-to-one Business Breakthrough Session with me to help you clarify and solve your particular challenges and empower you to confidently step forward. or pay £51 each week for 4 weeks. This contains the actual systems I use in my own property business which will enable you set yourself up the right way. Here are some of the things the manual covers. What legal forms do I use? You can also take advantage of a Business Breakthrough Session which will enable you to have any particular questions answered and empower you to take the next step towards making this a reality for you. Are you ready to join the ranks of successful property business people? Are you ready to create a business that can give you the freedom you want? In this premium package, you will work with me on a one-to-one basis where together we will go on viewings, go through everything you need to know about building a profitable multi let business and the idea is that You will have a house by the end of working with me. This option is only useful to people ready to take immediate action.